A screen door is the perfect solution to keep a home well ventilated while also preventing mosquitoes and other insects from getting inside. The screen door should be made according to the size of the doorway so that it fits perfectly and looks tidy. You can also put a decorative curtain on it to make it more colorful and ensure more privacy. Arranging – Arrange the required parts so that they are easily accessible when you start putting your screen door together. You can either buy lumber pre-cut to the sizes required or do it yourself. Make sure to label all pieces at the outset to avoid problems later. Cutting – Slot the boards into a mechanism that holds the saw in place and maneuvers it in the right direction. You can screw a board on to two other boards horizontally at 90o angles to hold them in place. Two of the lower boards could be riveted on to the workbench, which would help to keep the jig-square in place. Set the cutting depth to half the thickness of the board and begin cutting one line at a time – moving the saw back and forth until you have removed all the sawdust and debris between the two lines. Use a chisel to smooth out the joints. Do this for all joints. Assembling the Door — First put the parts together to ensure that the shape and fit is correct. Once you have checked the alignment, you can secure the parts with polyurethane glue. Do this for all joints, applying the glue with a disposable glue brush. Now clamp the joints together using C-clamps. Ensure that the shape of each joint is a perfect square and only then tighten the clamps. Once you have put the clamps in place, ensure that the door is square by making sure the diagonals are equal. Allow the glue to dry thoroughly before moving on. Fixing the Screen — Paint the frame or wood before attaching the screen. 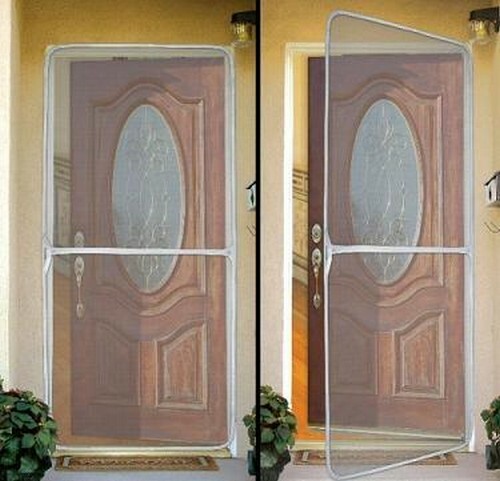 Spread the screening mesh on the door and pin it to the door at both top and bottom. Ensure that you have stretched the screening taut and that there are no wrinkles in it. Now staple the screen to the internal frame with the stiles all around. Trim the edges with a sharp knife to give a smooth edging. Put the screen molding all around the screen edges to hide the staples, giving a neat and tidy look. Attaching the Frame – Once your screen door is ready, you can fix the frame in place. There are many choices so you can use whatever you feel is best suited to your circumstances. The easiest is a spring-hinge and handle on either side of the door, but you should go through all the options available before you commit to a decision.